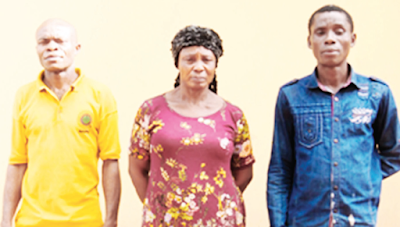 Justice Lewis Alagoa of the Federal High Court, Owerri, Imo State, has granted bail to the trio of Clementina Ndukwe, Anthony Njoku and Alexander Umunna, all alleged members of a three-man counterfeit syndicate operating in Owerri and its environs. Ndukwe, according to the Economic and Financial Crimes Commission (EFCC), is a bread seller in Owerri. The accused were arraigned on May 11 on a six-count charge bordering on conspiracy and currency counterfeiting to the tune of N1,147,000. The offence, the Head, Media and Publicity of the EFCC, Wilson Uwujaren, said in a statement, contravened Section 6(2) of the Counterfeit Currency (Special Provisions) Act, Cap C35, L.F.N. 2004 and punishable under Section 5(1) (c) of the same Act. Uwujaren said when the case, which was adjourned for consideration of bail application and ruling came up on Monday, counsel to the defendants, B. M. D. O. Chinekezie for the 1st defendant and I. G. Nwachukwu for the 2nd and 3rd defendants, applied for the bail of their respective clients. He said: “However, in view of the letter written by the 2nd and 3rd defendants to the commission which notice was brought to the court by prosecution counsel, Mashal Umukoro Onome, to change their plea, counsel to the 1st defendant, prayed the court to give him time to study the case file having recently taken over the case in order to ascertain if his client would follow in her co-defendants’ footsteps. “Thereafter, Justice Alagoa granted the defendants bail in the sum of N2 million each with three sureties in like sum. The case, which, according Uwujaren, bothers on conspiracy and currency counterfeiting, was reported to the EFCC on April 12 by the Department of State Services (DSS), Imo State command, where it was alleged that some group of persons were trading in counterfeit banknotes. EFCC, Uwujaren said, swung into action and commenced investigation where it was discovered that “the prime suspect, Mrs. Clementina Ndukwe, who sells bread at a popular bus stop in Owerri metropolis, had a link to other suspects in Lagos from whom she normally buys counterfeit notes”. He added: “Further investigations also revealed that she sells her counterfeit banknotes to the 2nd and 3rd defendants at the rate of N2,500 for every N25,000 counterfeit notes; the 2nd and 3rd accused will afterward mix the counterfeit notes with genuine banknotes and transact normal businesses with them.